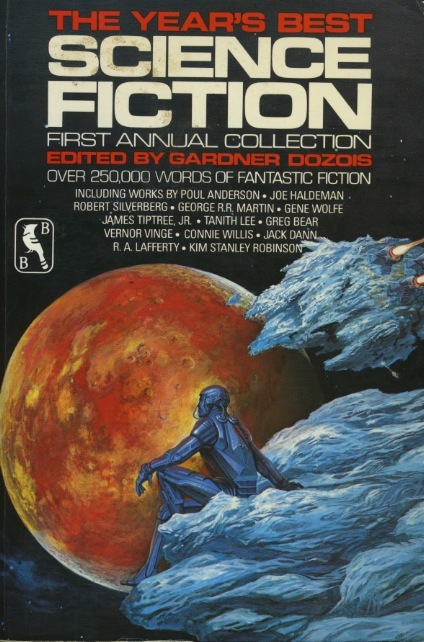 One of the first science fiction books that I ever bought was one edited by Gardner Dozois, one of his Year's Best Science Fiction collections (#18). I really loved anthologies early on (and still do), picking through and reading the summations of the prior year, and the fiction that made up the best of that year. Some of those stories still stick with me - one from Stephen Baxter (On the Orion Line), and a couple of others. For three decades, Dozois has been an institution in and of himself, providing a major anthology series for the science fiction community. It's a pretty astounding feat, considering that most 'Year's Best Anthology' series peter out after 5,7,10 years. The number of these survey anthologies has exploded in the last couple of years. Neil Clarke of Clarkesworld Magazine releases his first in a series, The Best Science Fiction of the Year, while John Joseph Adams began the Best American Science Fiction & Fantasy last year. There's others out there: Rich Horton's Year's Best science Fiction & Fantasy, Jonathan Strahan's The Best Science Fiction and Fantasy of the Year, Ellen Datlow's Best Horror of the Year, Paula Guran's Best Dark Fantasy & Horror of the Year and The Year’s Best Science & Fantasy Novellas, ChiZine's Year's Best Weird Fiction and Baen's Year's Best Military SF & Space Opera. There will undoubtably be more to come in the future, crowding the market, but these are useful books to have: they document the prior year, and expose readers to stories they might not have otherwise picked up, especially if they're not subscribing to major publications. Go read The Year's Best Science Fiction and Gardner Dozois over on Kirkus Reviews. Interviews with SF Signal (RIP), Black Gate, Book Banter, and SF Encyclopedia entries for Gardner, Anthologies and Asimovs. Mike Ashley's Transformations and Gateways to Forever also provided some extremely useful details.